To see more games from YayStuff, visit http://www.yaystuff.com/. You can also follow Yaystuff on twitter @yaystuff or become a fan of Yaystuff on facebook. 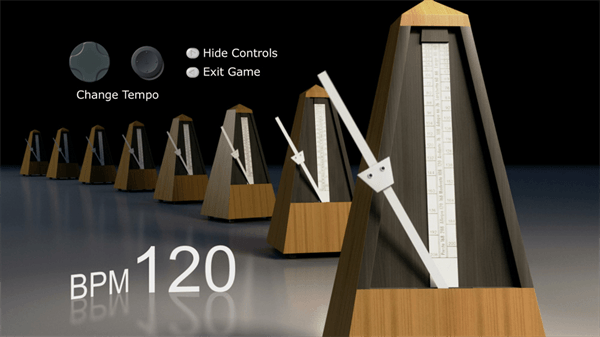 Metronome HD is a metronome simulator for your TV. By moving the Joystick you can adjust the BPM (Beats per Minute) and set the rhythm that you want. You can also use the directional pad to get a more precise BPM. Up and down on the directional pad changes the BPM by 1, and left and right changes the BPM by 10. You can choose a BPM between 60 and 800, enabling a rhythm for any type of song you want to play. I don’t usually play my guitar, but I pulled it out just so I can play a bit on different metronomes. I have to admit, that I couldn’t tell a difference between using my actual metronome and the one on Metronome HD. The only real downside is that I don’t make it a habit of practicing in front of my Xbox 360, but now that I have Metronome HD this could change. I can talk to my friends over Xbox live while practicing. Metronome HD offers something that a normal metronome would never give you. At 666BPM the entire background bursts into flames. This little addition made me laugh really hard when I first discovered it. At first when I was scrolling through all the BPM I thought there was a graphic bug, but I slowly pin pointed the location of the graphic change. When the background burst into flames I started laughing. As a game I can only give Metronome HD 1 capsule out of 10; however, since metronome HD was never meant to be a game, but rather a simulator, I must rate it according to how well it succeeds in its goal. Metronome HD recreates a very helpful metronome that keeps rhythm just like a normal metronome, and for only 80MSP ($1) it is much cheaper than a real one. So the final score for Metronome HD is 9 capsules out of 10, based entirely on the game replacing a normal metronome. If you are looking for a metronome, I would suggest to pick up Metronome HD. 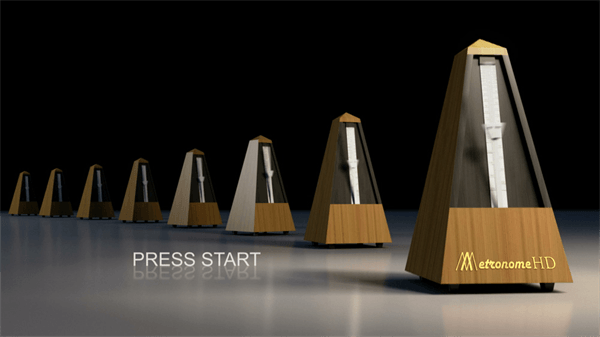 Classic metronomes are outdated, virtual metronomes are the new big thing! 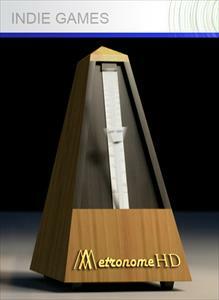 • Metronome HD is cheap replacement for a real metronome. • It keeps accurate rhythm between 60BPM and 800BPM. • 666BPM can replace the fireplace indie game. • It is simply just a metronome simulator. • Not everyone practices their instruments in the same room as their Xbox360. • 666BPM, although funny, is very distracting. What do you think of this cool little simulator. Indi games are very handy and here at Capsule Computers we would like to see and share out more great little games/simulators like this. If your an indie developer and would like to have your game reviewed on Capsule Computers. Drop us an email at info@capsulecomputers.com.au and we will be more than happy to help.